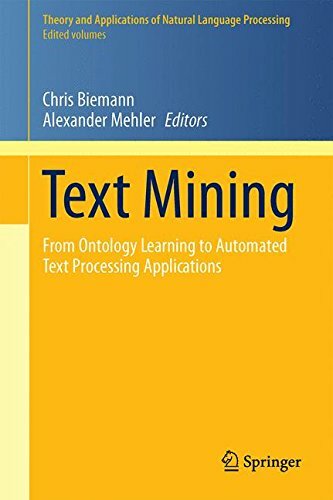 This book comprises a set of articles that specify the methodology of text mining, describe the creation of lexical resources in the framework of text mining and use text mining for various tasks in natural language processing (NLP). The analysis of large amounts of textual data is a prerequisite to build lexical resources such as dictionaries and ontologies and also has direct applications in automated text processing in fields such as history, healthcare and mobile applications, just to name a few. This volume gives an update in terms of the recent gains in text mining methods and reflects the most recent achievements with respect to the automatic build-up of large lexical resources. It addresses researchers that already perform text mining, and those who want to enrich their battery of methods. Selected articles can be used to support graduate-level teaching. The book is suitable for all readers that completed undergraduate studies of computational linguistics, quantitative linguistics, computer science and computational humanities. It assumes basic knowledge of computer science and corpus processing as well as of statistics. View More In Data Processing.